The Pink Team is posting this week for the Eclectic Ellapu Challenge and our theme was chosen by this week's marvelous Hostess, Berni. She wants to see creations done in Pink and Cream. Since she didn't limit it by saying "and no other colors", I had to have a bit of Christmas green. That incredible heart-shaped image is a freebie I found over at Graphics Fairy. I printed it, then fussy cut it with scissors, and added the lace and pearls. Quick note: I bought two little containers of those beaded pearl strings simply because they were on sale, with no idea how I might use them. I'm sure you've never done any impulse purchases like that, right? Uh huh. But now that I've used them here with lace, I see all kinds of possibilities. I used liquid glue and they seem to be pretty permanently affixed. 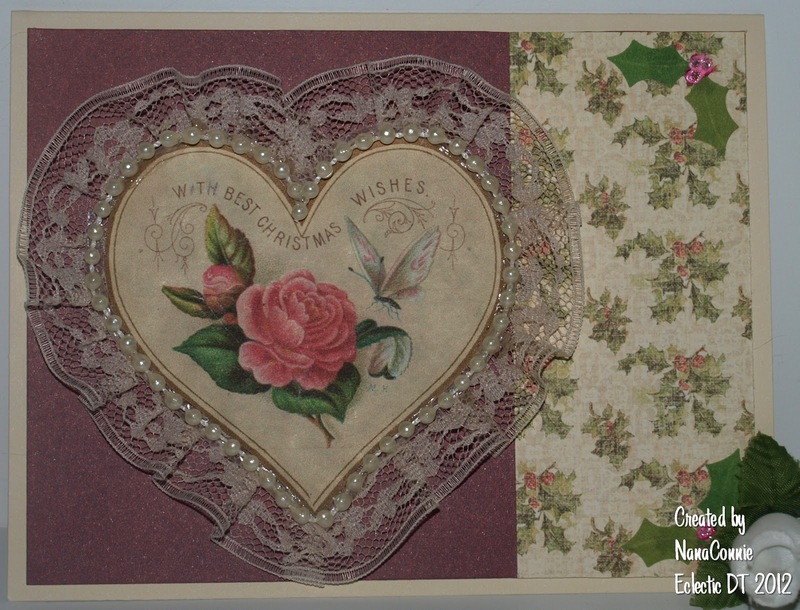 Since the sentiment in the image says, "With Best Christmas Wishes," I chose holly leaf paper in cream, pink, and green, and a complementing deep pink CS (which I distressed slightly by sanding it) for the background. I added the corner holly leaves and berries, and felt it just didn't need more embellishment than that. I didn't want to take away from the heart and the lace. I think this is deliciously vintage, though others may feel it doesn't have enough embellishment for true vintage. I'm very pleased and satisfied, however, and I know just who will receive this card for Christmas. :-D Nope, don't ask -- I'm not telling! She might read this blog post. Shopping Our Stash -- Had to buy it, it was on sale! Less than 2 weeks until Thanksgiving (for those of us in the US), and I wish I could tell you I was totally ready. NOT! But, most of my cards are done and ready to mail. In fact, those which are destined for Japan went in the mail yesterday. The rest of them will be mailed this week for delivery to their various locations around the States. OK, so the post title is a little 'punny' but I love both the image I used and the theme for the new Tuesday Throwdown challenge this morning, which is "Fall Leaves." 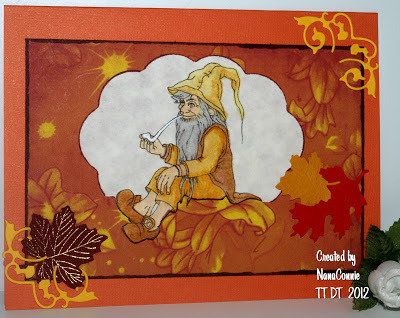 Our fantastic sponsor is Robyn's Fetish and the image is called "Gnome." In addition to the image, the background paper is also a digital from Robyn's Fetish and I printed it, then turned it so that I could use the 'leaves' (which are probably a flower) as a pile of leaves for him to sit. Let me show you my card, and you'll see what I mean. The sketch is from Outlawz, turned on it's side. Isn't he just precious? And isn't that paper fantastic? Oooo, I really love it! He's colored with Copic and Spectrum Noir markers, then die cut using the 'out-of-the-box' technique so I could get him to 'sit' on the leaves. I outlined him and the die cut with distress markers. I hope you had a great weekend and that your week is going well so far. The autumn chill is back after a couple of days in the low 80s and my poor fur babies don't know whether to cuddle up with me or search around for a cool spot. lol Poor kitties. Soon the winter weather will settle in and then they'll be longing for spring and spot of sunshine on the carpet where they can lie down and bask. New releases at Doodle Pantry today and I chose to use the two fawn images from the "Small Deer" set shown right below my card. 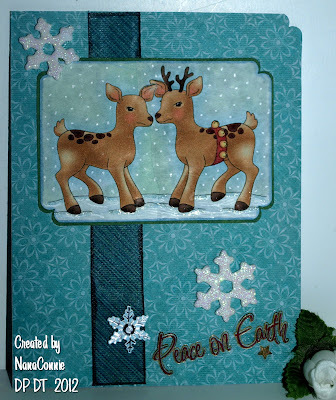 While I didn't happen to use any of the fabulous papers or sentiments, they are included with the set and it also has the outline images, which I did use. I printed and colored my two fawns (somewhat darker than those in the set but I tried to get the same shading) and then fussy cut them and adhered them to a parchment paper background, overlapping them just slightly. I added the coloring for the sky and the snow, and used white gel ink for the snowflakes in the sky. My papers and the mat for the image (all corner punched) came from Basic Grey and have been in my stash for at least last year, maybe longer, so don't ask me which stack. The two larger snowflakes are punched from foam and then glitter is added. The smallest snowflake is punched from acetate (I punched 3 of them and glued them together then added a gemstone brad) and I drew with silver gel ink on the top one. There are many more fantastic releases today over at the Doodle Pantry website so be sure to check them out. I'll be using a few of them in the upcoming month, and I hope you'll find some inspiration from those posts. This is the set you'll get free just for entering the challenge this month. And this is the set you can get free with any purchase between now and November 24.